One of my recent hobbies (aside from breaking my WordPress site) is anything related to the Raspberry Pi. I use it as a network media player in my living room, USB computer on a stick and as a retrogaming console. Nintendo recently released the NES Classic Edition which comes with 30 built in games. This holiday season it will be a big hit and it sold out almost as quickly as it was released. With a Raspberry Pi 3 running Retropie you can accomplish almost the same thing. It just takes a little geeky work and some parts. Here’s the parts and links. I usually just drive out to Micro Center in Westbury and get it in person. OK, that added up quickly. The NES Classic Edition is $59.99. Add another $9.99 for a second wired controller and you’re only in for $69.98. I begin to see what Lily means. Grownup’ing is a pain. The XBox 360 wireless controllers that I linked to also include a USB transceiver. That part number JR9-00011 is cheaper than just a controller alone. I don’t know why. Just about any USB game controller that works with your PC will work with Retropie. I picked these because I had a spare and I like being able to sit on the couch while playing. I’ve never tried burning the image using a Mac. On a PC I just use 7Zip to expand the retropie-4.1-rpi2_rpi3.img.gz and use Win32 Disk Imager to write it to the microSD card. There are some really good detailed instructions for installing and configuring Retropie here. When it boots you will be asked to configure your controller so you’ll need to get your XBox 360 controllers working. I think the Xpad driver ships and is activated by default. I don’t recall activating it myself. If that’s not the case then I’ll update this post. Put batteries into your XBox 360 controller, and plug the XBox 360 Wireless USB transceiver into any free port on your Pi. Press the stylized XBox button on your controller to turn it on and then press the button on the transceiver. The front of your controller has a not quite recessed wireless sync button. Press that and your controller will connect to your USB transceiver. 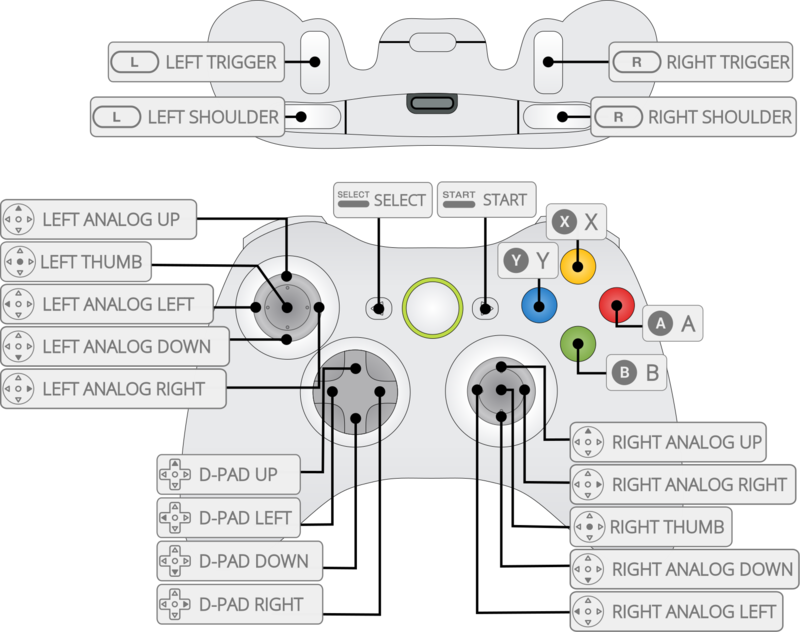 Press a button on your controller to begin configuring it. From the Retropie Git docs, you’ll configure the buttons like so. The image is from that Retropie installation page. I didn’t want to hotlink the image as that’s rude. If it’s a problem I’ll remove the image. You will get some of the button assignments wrong. Don’t worry, as long as you get the D-PAD, START button and A button assigned then you can redo it later on. That USB transceiver supports up to 4 controllers. When you use PS2 emulation for games it not only works but so does the rumble part. That’s cool. I happen to have an Etherenet connection onto my Raspberry Pi 3. It also comes with a built in 802.11n wifi adapter. You want your Retropie on your network and being able to ssh to it is very useful. Borrow a USB keyboard from your PC or Mac so you can enter your wifi key. You won’t need it afterwards. I do all my Linux admin via ssh from my PC or Mac. Your Raspberry Pi 3 running Retropie is a Linux server. It’s running a Debian based distribution called Raspbian. If you’ve spent time administering an Ubuntu LTS VPS then this will feel very similar if not downright identical. The reason for getting your Retropie on the network is simple: once you do you will find a new Windows share at \\RETROPIE and you can deposit the NES ROMs you obtain in \\RETROPIE\roms\nes as easy as drag-n-drop. You’ll have to do some research where to get them yourself. They’re not hard to find. When you do obtain NES ROMs make sure you keep them in individual ZIP archive files. Don’t extract them, just from them as is into your nes directory. Once you’ve gotten your roms onto your new system, press the “start” button on your controller and restart emulationstation. Retropie supports many retro arcade systems. My favorite are MAME, SNES, NEO GEO and of course NES. I don’t play a lot of Atari 2600 games though I should. That’s one of the systems I had as a kid. The emulators are easy to use. Generally you just drag the ROM zip file into it’s directory. Use \\RETROPIE\roms\nes and \\RETROPIE\roms\snes for the right one. You’ll see many more directories there but for now ignore them. You can explorer them later. If you are just looking for the classic NES games and can get your hands on one even with the small controller cables, then do so. This illustrative YouTube video can explain the mindset of people who do this sort of thing. You’ll either immediately understand where I’m coming from or you wont. That’s OK, some people just enjoy the nerdy aspects of things. Part of the appeal of the Raspberry Pi 3 is that it is a server with a quad core ARM CPU running at 1GHz. It has 1 GB of RAM built in. With a 32GB microSD card, case, and A/C adapter it’s a full on Linux server for less than $70. Setting up a small PC with similiar stats will run you at least $200. The small size of the Raspberry Pi 3 shouldn’t take away from the fact that it is a Linux server. It has a default user ID and password. You should change that if you’re concerned. Here’s an example of what I mean. Yesterday I did the following. ssh’ed to the retropie as the pi user. Selected “Update all installed packages” and skipped the OS ones because I already did those. Had coffee. See illustrative video above. Ran sudo reboot to reboot box. If you read that, stopped at step 2 and said “Are you kidding me?” then it’s alright. You’re OK. The NES Classic Edition is for you, it’s $60 and it is fire and forget. It does not have any network capabilities, it will never be updated. And there’s no legal question about using one either. If you want to roll your own and don’t mind getting up to your neck in Geeky Nerdy things then maybe the Raspberry Pi 3 is for you.